When it’s time for an old, vacant building to come down, St. Louis has long used demolition as pretty much a one-size-fits-all approach. Compared to the alternatives — like a more careful, piece-by-piece salvage job — it’s cheaper and faster. And it’s also something of an ingrained habit or tradition. But city officials like Ginn are re-evaluating business as usual when it comes to demolition. SLDC announced Wednesday that at a 30,000-square-foot warehouse in north St. Louis, it will take its first look at the alternative practice known as “deconstruction” — the piecemeal disassembly of a building that cuts down on waste by salvaging reusable materials to be resold, from bricks to wood to windows. Combined with a pilot project that will deconstruct 30 buildings early next year, the city is testing whether it would make economic and environmental sense to adopt deconstruction more often across the 12,000 vacant properties it owns. Proponents of deconstruction tout multiple reasons for its allure. 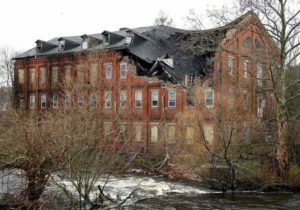 Economic opportunity and job creation are often at the top of the list, with about five times as many workers employed by a reconstruction project than a comparable demolition. It’s also viewed as a safer alternative, since demolitions can produce “halos” that affect surrounding areas. For instance, a Tulane University study published in 2006 found elevated blood lead levels in St. Louis children who lived within a block of multiple demolitions. “The majority of the buildings that we’re demolishing in the city were built before 1930, so the potential to have lead paint and asbestos is pretty high, and when you do a strategic disassembly of a structure, you’re much more likely to catch all of those potentially hazardous materials,” said Ginn, who added that, in recent years, stricter safeguards have gone into place to minimize public health risks from demolitions. But perhaps most importantly, supporters say conditions in St. Louis are ripe for widespread deconstruction to take root, if some extra effort is made. The city’s wealth of old, vacant buildings contain valuable, sought-after materials, destined either for a landfill or for a second life. “Quality, quantity, variety: This is a great city for salvage,” said Eric Schwarz, founder and executive director of Refab, a nonprofit salvage business based in south St. Louis. This week, the company secured the SLDC’s first deconstruction grant for the warehouse at 4208 Martin Luther King Drive. The brick structure, which dates to 1884, “was slated for demolition as part of the Rhema Church’s relocation from the National Geospatial-Intelligence Agency (NGA) project site,” according to the SLDC. “We hope that this is the first of many of these contracts,” said Schwarz, who adds that the project will employ nine people for up to six months. He estimates that 90 percent of the building’s material can be resold. He has even higher hopes for the city’s 30-building deconstruction pilot set to begin next year. 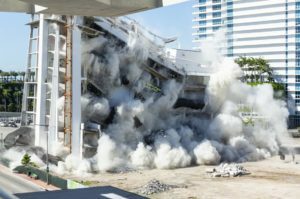 “We’re using this as an opportunity to really look at the numbers on deconstruction of smaller homes, so we can make a case for deconstruction instead of demolition on hundreds of homes,” Schwarz said. That project — done in partnership with entities that include the Environmental Protection Agency, the Missouri Department of Natural Resources and St. Louis Community College — will take a close look at how deconstruction stacks up against 30 conventional demolitions. Ginn rattles off a list of the comparisons the city will pay attention to. “We’re going to be looking at tonnage that went to a landfill, materials that were resold, where were they sold, how much did they get for them, how many people were employed on the site and how well were they paid,” she said. It will also examine overall cost. “What we’re hoping to accomplish is that for the same cost as demolition, we employ more people, we send less material to the landfill, and we create some local market opportunities through material salvage and resale,” Ginn said. The buildings included in the pilot project have yet to be finalized. They must be city-owned properties that meet a host of other conditions — such as being vacant for a short-enough period of time that the materials are not likely to have degraded. “They also have to be bad enough to warrant demolition, but not so bad that we couldn’t fix them and sell them. So there’s this sweet little spot in the middle and that’s where deconstruction lies,” Ginn said. “That is part of the larger process that the city and SLDC and (the Land Reutilization Authority) are working towards, is inventorying all of these structures and being able to say, ‘This one is demolition, this one is deconstruction, this one needs some work, or this guy is ready to sell right now.’” One looming question is whether a larger reconstruction business community can emerge in St. Louis. Right now, Refab essentially has the local market to themselves, mining buildings for old-growth lumber “milled to extinction” and aged, locally made bricks of wide renown that are trucked to buyers as far away as Arizona, Texas and Louisiana. But it’s time-intensive work that can be tricky to break into. In December, the city will allow demolition contractors, construction companies and others to apply for free training that they hope can spur growth of the local reconstruction industry. “Everyone that comes and walks through our structures is always blown away and says we’ve got this missed opportunity here,” Ginn says. “We have the materials. We don’t have the market network. Yet.” “We think that any healthy industry has competition,” adds Schwarz. “We would love to have competition here.” He points out that St. Louis used to support a stronger landscape of salvage businesses, which played a key role when the construction of the interstate highway system wiped out historic swaths of homes in neighborhoods like Soulard and Lafayette Square. Schwarz and Ginn want to see the city start to reclaim more of that heritage as early as next year. “We intend to see 800 demolitions in 2019. If 100 of those could be deconstruction, we’d all be very happy,” Ginn said.